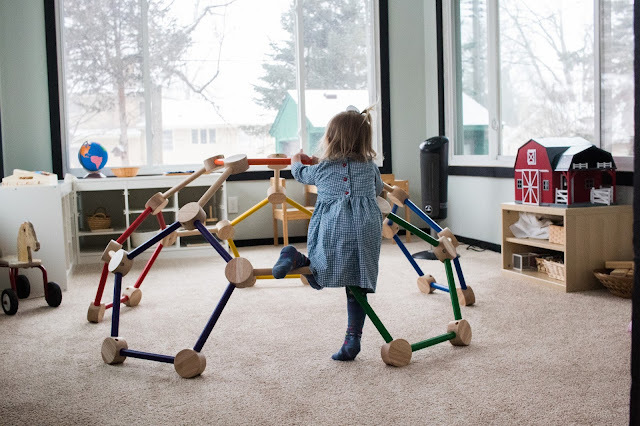 One of the things that I love about Montessori is that it emphasizes the beauty of the natural world from the earliest age. It focuses on what's real, true and concrete. 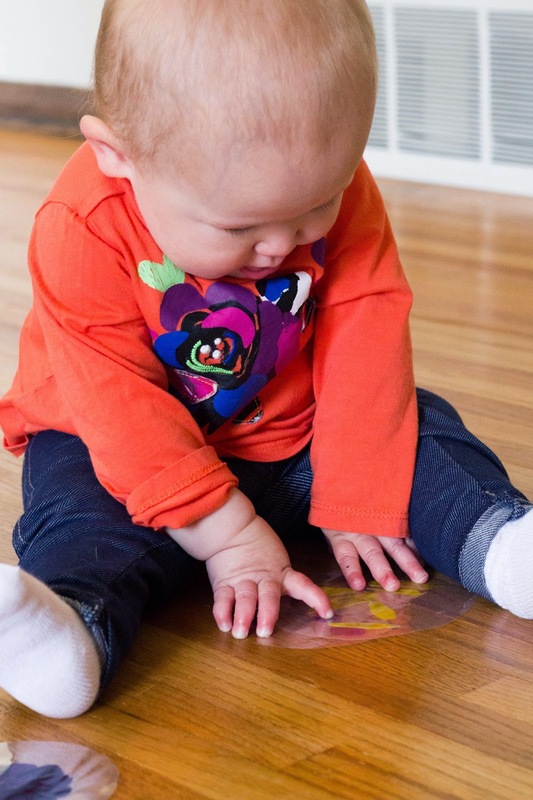 There is so much beauty in the real world and to discover it through the eyes of a child is a gift. 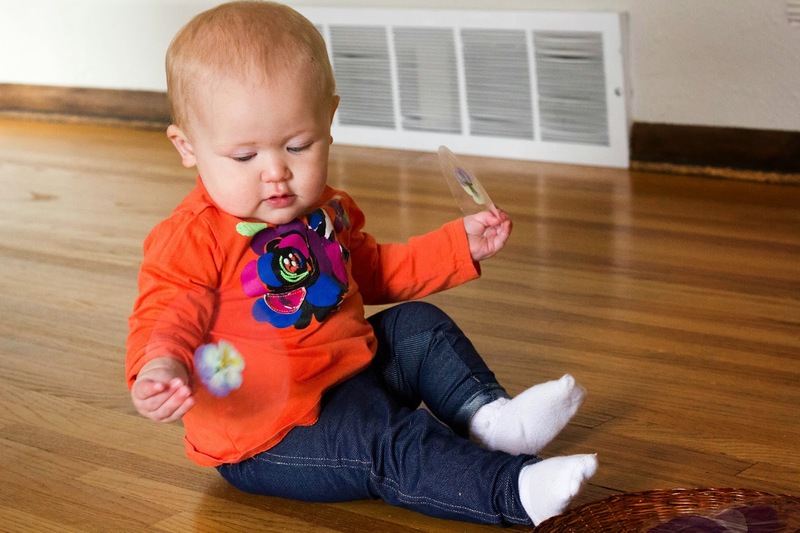 Now that Spring is upon us, I want to give Nora the opportunity to discover some of our natural world. 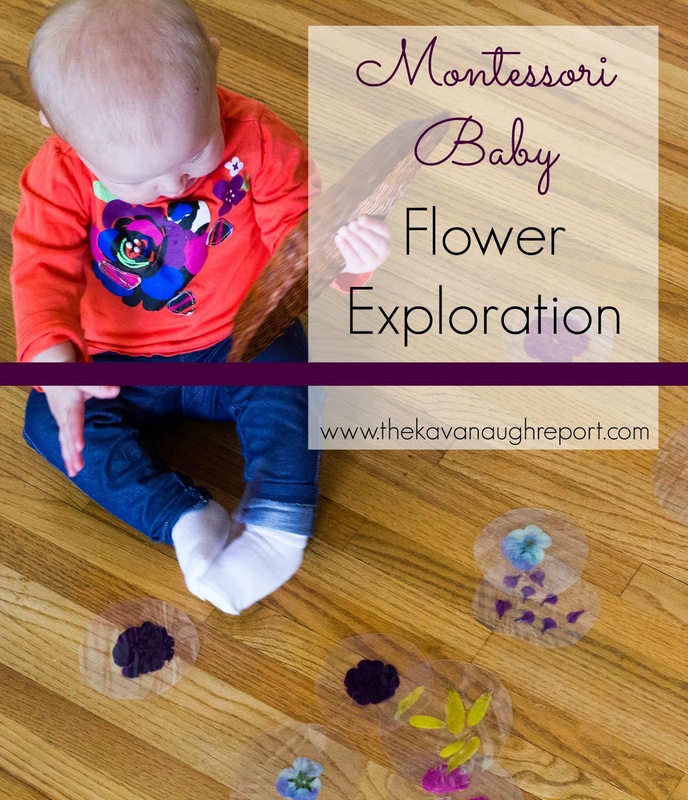 So, I created this laminated flower exploration for babies tray. 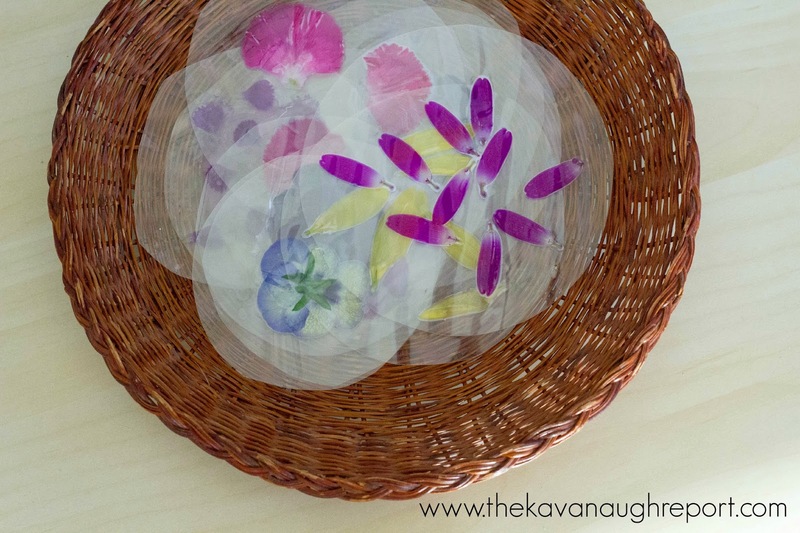 However, instead of using plain flowers, I choose to laminate flowers and flower petals instead. 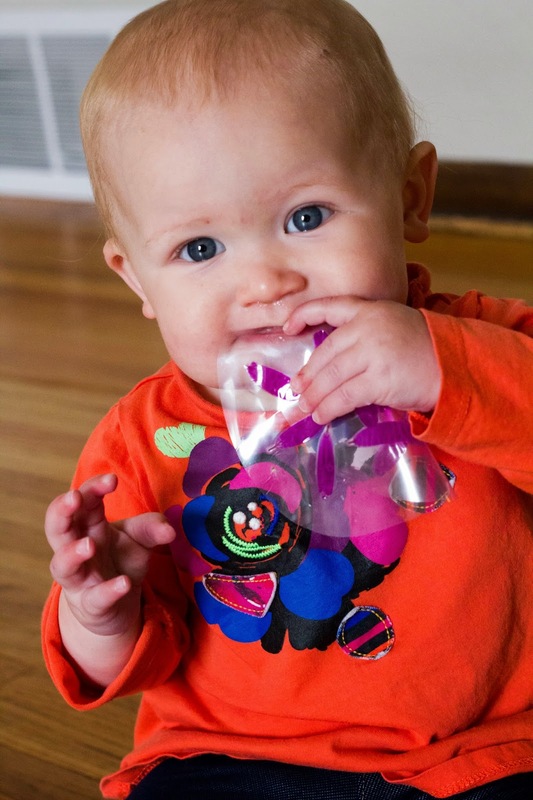 This allowed the flowers to withstand some not-so-gentle hands, and kept actual flowers out of Nora's mouth. I'm no expert in what types of plants are safe to eat or not, so I didn't want to risk anything. Also, this allows the work to last for a bit longer. In order to laminate, I had to pick smaller delicate flowers if I wanted to laminate the whole thing. If the flowers were thicker, I pulled the petals off and laminated them on their own. The heat from the laminator did discolor a few of the petals, but not so much that they couldn't be used. In fact, I think many of them were down right beautiful. 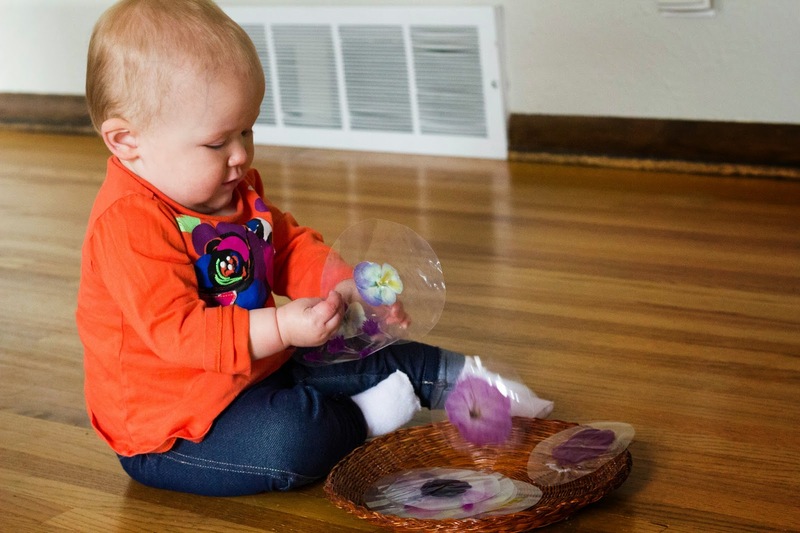 Once laminated, I cut large circles so they flowers could easily be manipulated by little hands. 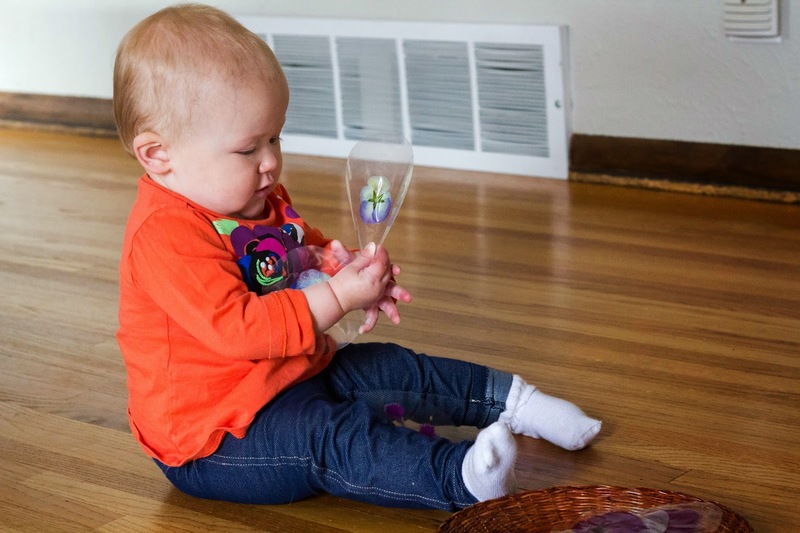 To present, I placed the flowers in a basket-tray for Nora to discover. She was immediately intrigued and had to have a taste! 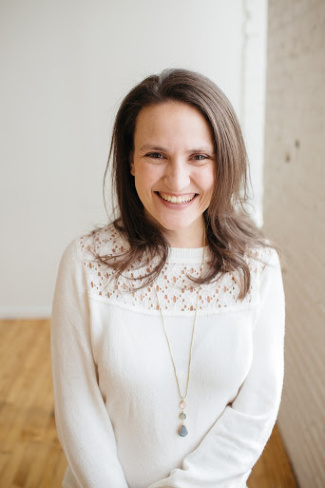 She spent a long time just watching them move as she crinkled the sheets in her hands. She tried in vain to pick the smaller flowers apart from the paper to eat. I also liked these because they were great fine motor practice for her. She had to work to pick up the sheets from the floor, yet the flowers made her completely motivated to do so. As Nora was exploring each flower I kept up a conversation. I kept it simple so it wouldn't distract from her own concentration. Mostly things like "look at the yellow flower," "blue flower," or "I like the purple petals." 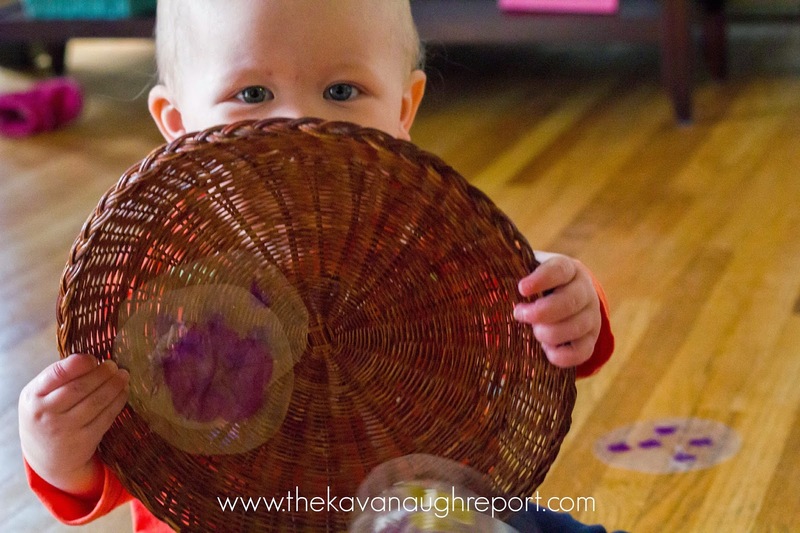 This basket will go on Nora's shelves for this month so she is able to explore the flowers throughout the month. I will say, that because some of the flowers are thicker there was some air between some of the flowers and the lamination. It wasn't enough to effect the lamination, but the flowers have faded some over the past few days. Nora wasn't the only one who liked the basket. Henry was also drawn the flowers. He really enjoyed being able to look closely at the flowers. The lamination made it really easy to get a good look at the flowers. He has returned to this tray as many times as Nora has. I may have him draw the flowers as an easy extension soon. For an older child, these could make an easy addition to a botany study. 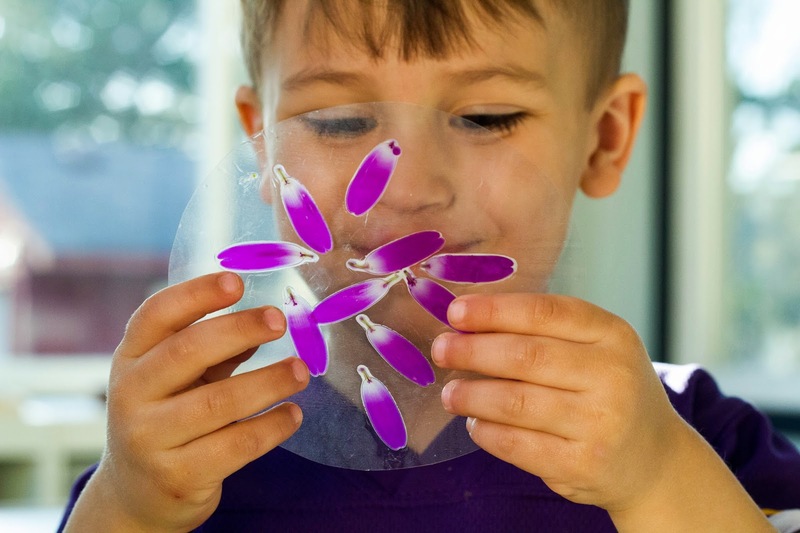 These laminated flowers would also be great on a light table, or could be used to identify the parts of a flower. I may try doing some other plants too! 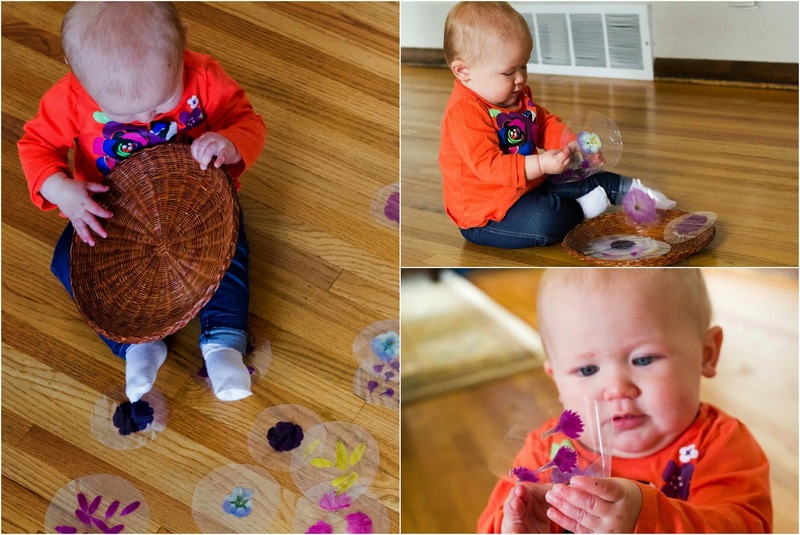 This flower exploration is an easy way to introduce science and botany to babies. It's the perfect combination of sensory and science. I hope you can enjoy as much as we have! 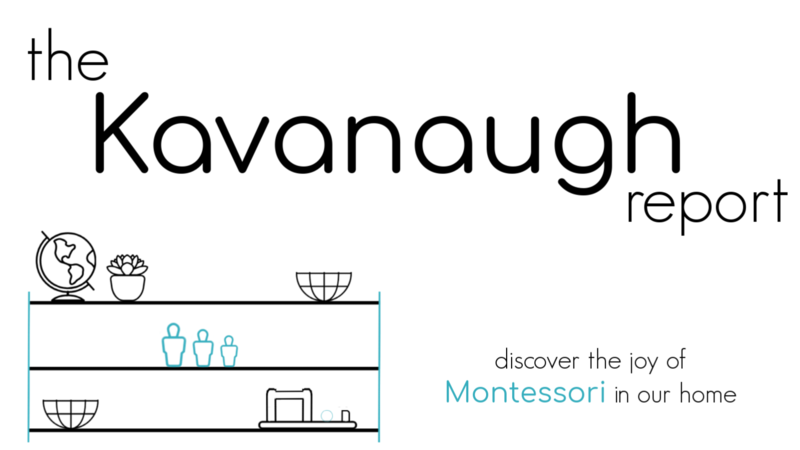 This post is brought to you as part of the 12 Months of Montessori Learning series. Our theme this month is botany. 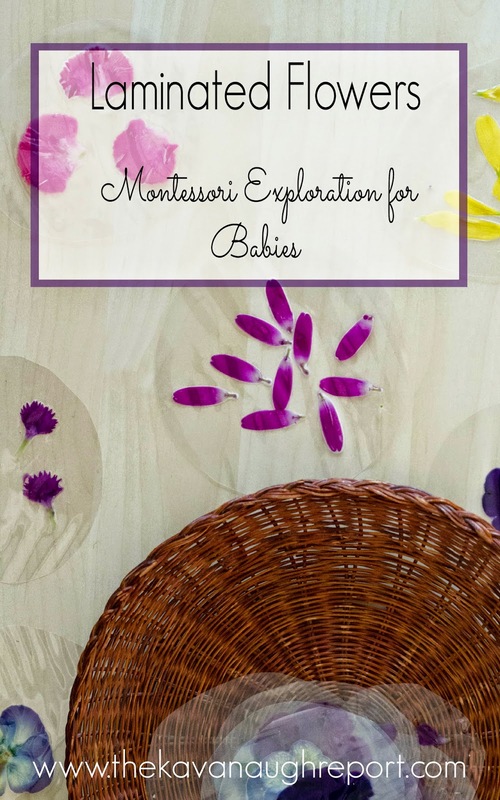 Visit these great bloggers for more Montessori and Montessori inspired botany posts! 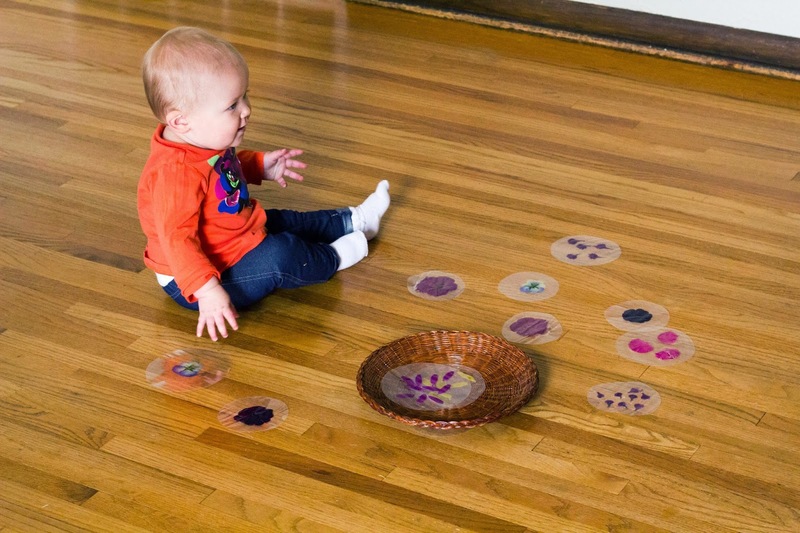 What a fun filled fantastic idea for all ages! I love it! This is a wonderful idea! The laminated flowers are SO pretty! I love all your ideas for babies. :) Pinned! 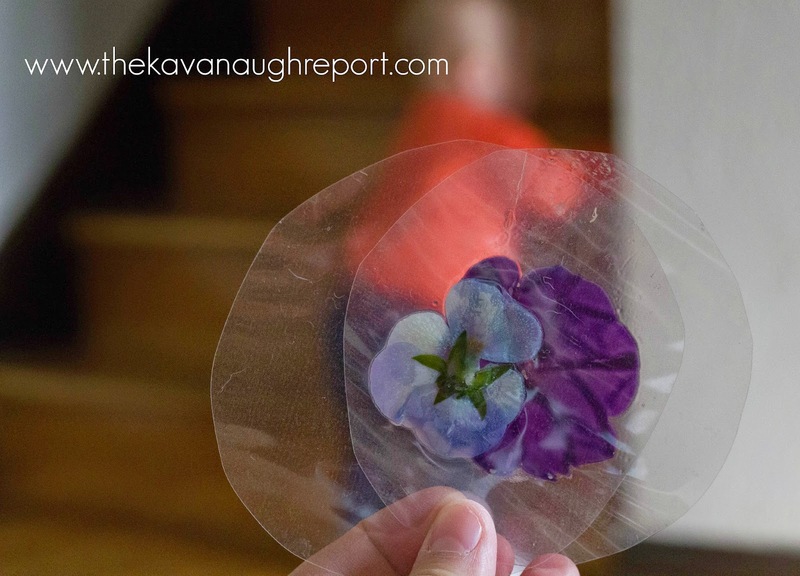 Love the idea of laminated flowers! :) What a great post! I am not sure if my comment was saved. 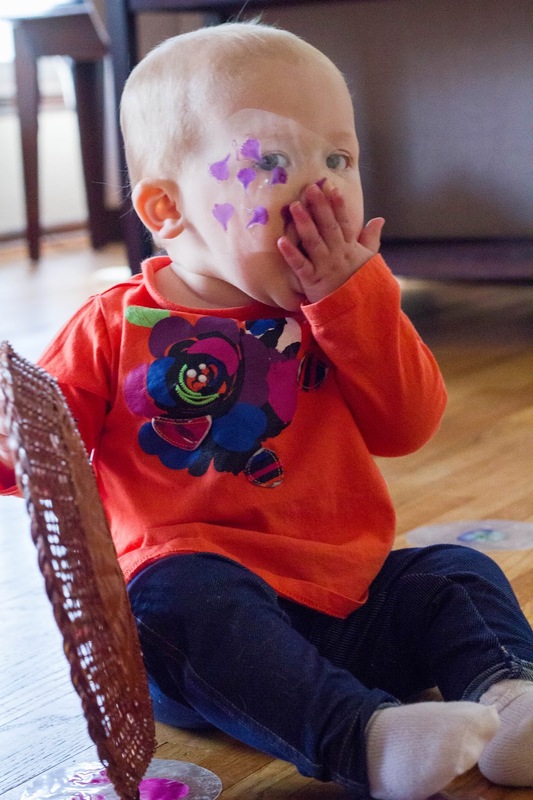 But as I said previously, you have the most adorable model <3 I did not even know that you can laminate flower petals. I have to try your ideas, so wonderful and cute! What a cute idea! 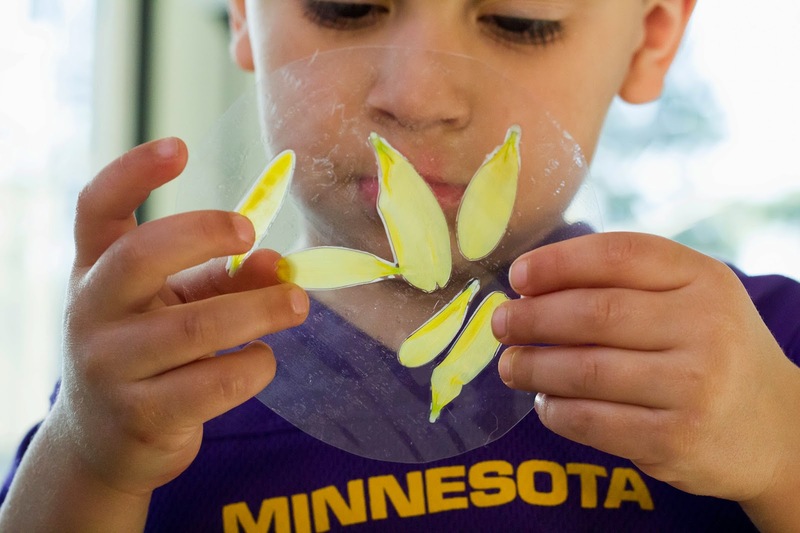 I never thought about laminating flower petals. We'll have to try it. 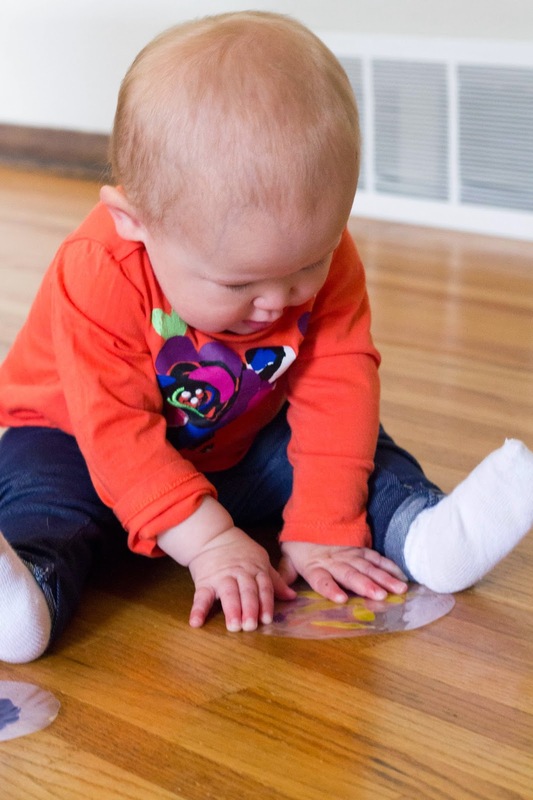 I love how laminating them allows children to return to the work over and over again, in true Montessori fashion. 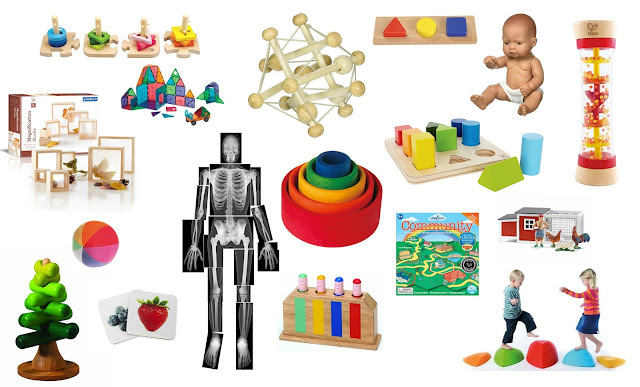 It would also be fun to explore these on a light table! I really understand why you chose to laminate the petals and they look lovely. 1) Shop-bought herbs are edible so once washed are good to use. I have lists of other flowers but not sure if the common names would make any sense as I'm British. 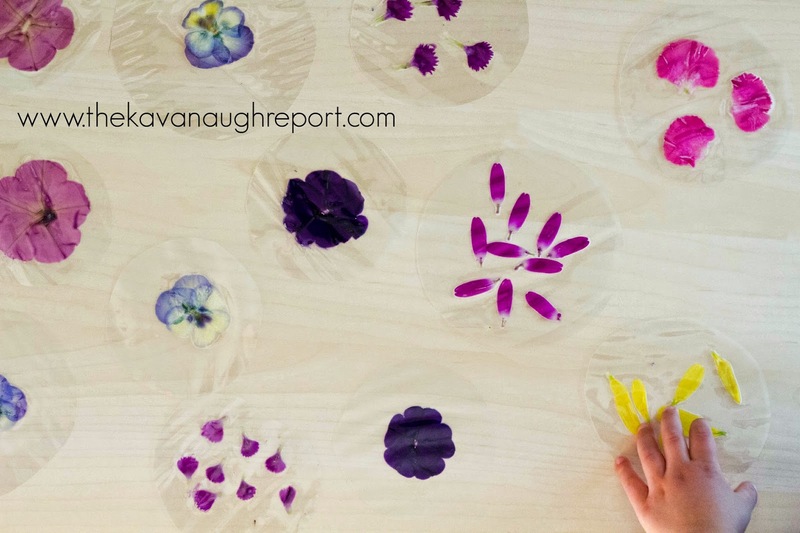 2) If you press and dry flowers, then laminate, the colour is likely to last longer and less will be affected by the process. Flower presses can be easily made from cardboard (and your children could decorate them to make them look far prettier than my slap-dash approach) http://creativestarlearning.co.uk/early-years-outdoors/diy-clipboard-flower-press/ The advantage of these portable ones is that you can press-n-go when out on a walk. I'll definitely be going back and recommend this Flower Delivery Near Me to everyone. The flowers I ordered turned out lovely. They took what I asked for and turned it into the loveliest of creations. 5-star bravo.